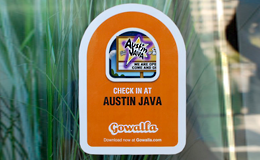 Companies (or anyone really) can get a custom stamp for their spot (vs a generic coffee cup, etc), plus the spot gets special promotion inside Gowalla. Prices vary, but a spot tomorrow in Austin is only $150. But, if you want to promote your spot for next August in San Francisco, it’ll cost you a little over $1,000. I’m thinking these could make great Christmas presents. Find out more and get your own badge here. I picked up the May copy of Wired’s UK edition this week. I’ve always preferred the US version since I’m not in the US- it keeps me up to speed on what’s happening there- but it hit me how powerful the UK version is for the European start-up scene. Enter the Wired 100 People. Everyone knows the legends in the Valley, and everyone goes on and on about the Valley (it *is* a special place afterall). I’ve been here for 10 years and Europe has always had problems gaining start-up momentum – there’s no epicenter, there’s no critical mass- and there are no Heros. Wired is creating local Heros, and I applaud them for it. Singling out successful entrepreneurs, investors, inventors- and holding them up – is something Europe desperately needs. It’s not going to instantly make a scene- but the Wired 100 + the Silicon Alley map they produced last year + …. starts to create a sense of community. And that’s just what Europe needs. 1. Grants of $5,000 to those who’ve built gadgets we’d like to see developed further. You’re eligible to apply for a grant if you’ve developed a gadget that’s in our Google gadgets directory and gets at least 250,000 weekly page views. To apply, you must submit a one-page proposal detailing how you’d use the grant to improve your gadget. 2. Seed investments of $100,000 to developers who’d like to build a business around the Google gadgets platform. Only Google Gadget Venture grant recipients are eligible for this type of funding. Submitting a business plan detailing how you plan to build a viable business around the gadgets platform is a required part of the seed investment application process. If it’s google gadgets now, are google apps next? On a related note, does Google’s recent ubiquisys investment + FON = ?